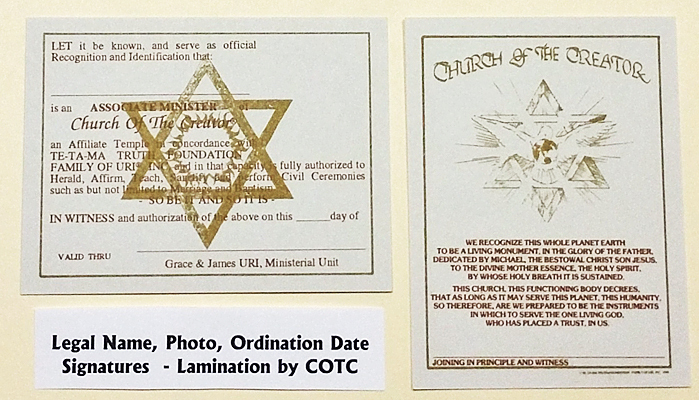 Photo ID Card Replacement for COTC Associate Minister and/or TE-TA-MA Pastoral Pastor. 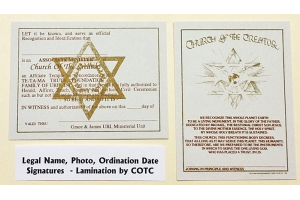 Replacement Credential due to name change, loss, damage or other circumstances requiring replacement of the original Photo ID Card issued upon Ordination. Purchase requires specific information relative full legal name, documentation of name change, date of birth, reason for need of replacenent. Suggest contact with COTC National Office via email or Contact Form, providing details necessary to verify above information in addition to fee payment. Process requires a new blank Photo ID Card be mailed for signature, returned to National Church Office with current ID photo like drivers license, via return mail or digital file attached to email to Church.